Jean Illingworth grew up in the small hilltop village of Sowerby. She chronicles the history of life in this rugged Pennine community through the stories and memories of those who have lived and worked there. 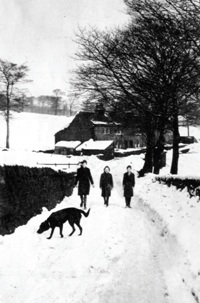 This snowy photograph was taken in 1947, one of the worst winters ever experienced. Remote farmsteads on the hill tops were challenged with the serious situation of trying to survive the terrible elements that encapsulated them for weeks on end! The photo was taken by Mr Sam Fox who in later years was our next door neighbour for many years at The Curatage in Pinfold Lane. It was taken on a walk along Dean Lane, passing Field House on the right and continuing along the road towards Mill Bank. They had walked by the top end of Bluebell Wood on the left prior to climbing up the hill that now faced them. Mr Fox's' children, Sam aged 13, Jo aged 9 and Gavin aged 12 are with the family pet dog "Sheila". Behind them are a row of cottages called Nether-ends, meaning "the bottom of the field" There were 6 cottages here and at one time the families who lived there had between them 28 children. A small community living in this peaceful haven tucked into the roadside. It was during the late 60's when they were finally demolished; a friend who lives nearby was haymaking in the fields and remembers it well. Families moved into houses newly built on the estates at Beechwood or Sowerby, to enjoy the luxury of indoor sanitation and the modern facilities of the 1950's. On March 4th 1924 the local poet and postman Levi Haigh visited "The Seven Sisters of Sowerby" daughters of the late Mr and Mrs John Bottomley, of Nether-ends. In his Poems Booklet No3 there is a poem dedicated to these ladies and a photograph also. This was taken by his friend Thomas Heap who used to accompany Levi and take photographs of local folk and the Sowerby area. He lived at one time in one of the cottages in Church Terrace, Pinfold Lane and had a large hut at the rear for his photographic work. His dedication to capture "Old Sowerby" has ensured that the evidence of this historic place lives on! 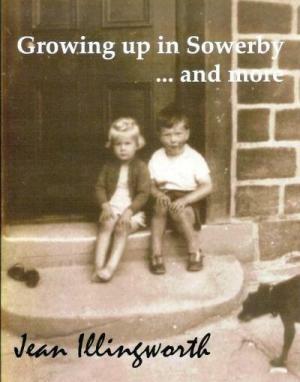 This picture and many more features in the book, It is the result of people reading "Growing up in Sowerby and More" and telling their stories and memories of living at some time in their lives here in Sowerby. Although folk move away it appears that this area is engraved deeply in fond memories and into their roots! The book also contains some of my personal family details and how I set about writing in the first place. It has been a labour of love and nothing ever runs smoothly but some advice I was given by an experienced writer, journalist and broadcaster was, to "Keep moving" this I have tried to do. Hopefully the end product will be informative and also reveal the many talented people this area has produced. The ancient hilltop village of Sowerby with its fine Georgian church can be seen for miles around. 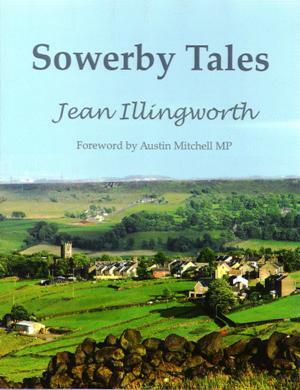 Jean Illingworth's engaging history weaves her own memories with the recollections of others in her local community, to reveal a rich and detailed picture of the life and character of this "very special" place. "Congratulations on doing such an important job!" "Brings Sowerby to life, and I love the photos"
"Anyone who knows the village will have their childhood memories rekindled with a nostalgic look back to a bygone age where the reader is transported back in time"